I’m a huge fan of the Sewaholic Renfrew Top (and have made a couple of those), but as my quest for the all handmade wardrobe continues and the realization that I mostly wear jeans and t-shirts, I figured it would be nice if all my t-shirts didn’t look exactly the same. The Renfrew can be a bit snug, which I like about the cowl version I made, but I wanted the option of a looser fitting basic t-shirt pattern. 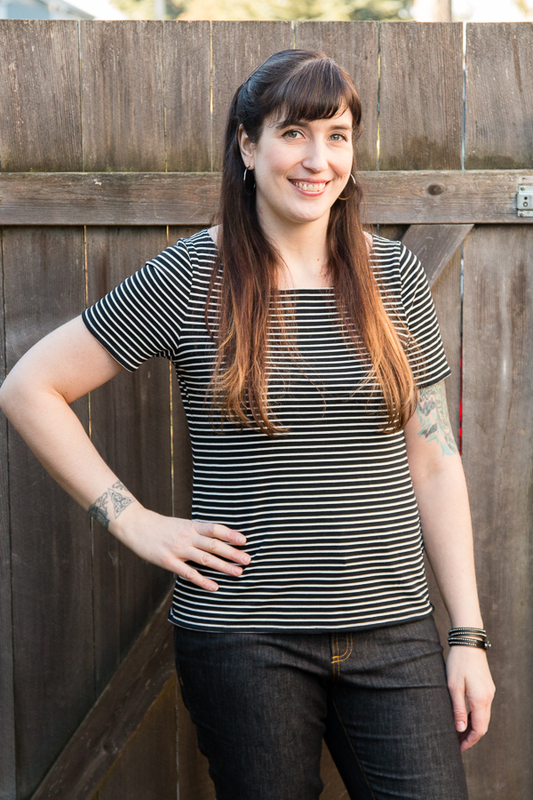 I also like the look of t-shirts with no neckband or cuffs and it makes it quicker to put together, so the Grainline Studio Lark Tee was just what I had been looking for. A printed version of this pattern is available, but one thing I love about the Grainline patterns is that a copy shop file is available in the pdf version, so you can download it immediately, have your copy shop print it and then not have to deal with all the taping. Since I was excited to make this right away and didn’t want to wait for it to ship, I purchased the pdf version. I love this fabric, it is just the right weight and is so soft! Black and white stripes are so classic and with the boatneck creates a fun nautical look. 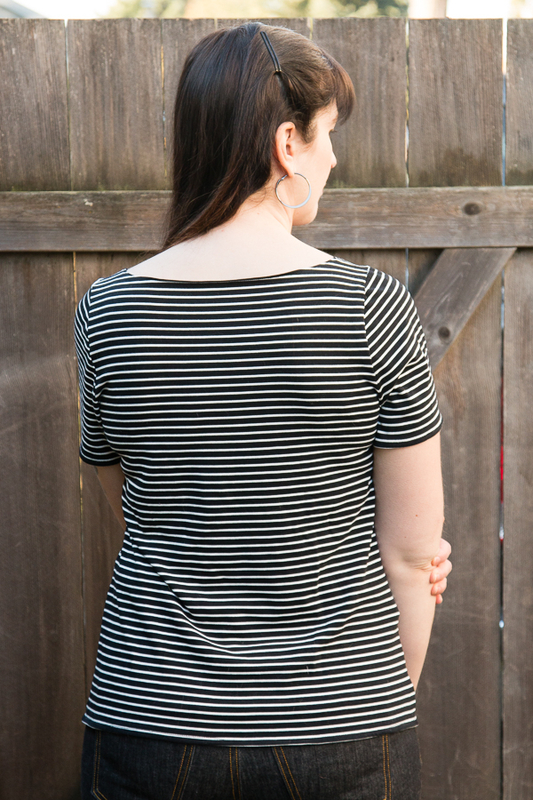 Because I was able to grade this pattern and the shaping of it (instead of straight lines at the sides it curves out at the bottom slightly), I feel like this t-shirt fits me better than any store-bought tees I have! Why yes, those are my Ginger Jeans! My only complaint is that the neckband wants to roll out at the edges (You can see this a little bit in the back shot). It’s partly the fabric and partly because I didn’t top stitch close enough to the edge of the serged seam at the neck. I can press it and it will stay for a wearing, but who wants to have to press their knits every time they wear them? I may rip out the top stitch at the neck and fix it. This won’t keep me from using this fabric or pattern again, as I love everything else about both of them. I’ll just remember to stitch closer to the edge next time or even use a twin needle to really reinforce it. I have been such a huge fan of Jen Beeman’s for a while now. I used her silk cutting tutorial for my wedding dress, I went and saw her speak at Dry Goods Design and I even met her last fall at Camp Workroom Social. So I can’t believe that this is the first time I have sewn one of her patterns. It certainly will not be the last though. I just started an Archer Button Up (in a gray and black plaid) and have a Linden Sweatshirt (in a gray quilted knit) and Moss Skirt (in denim) cued up as well. I own the Cascade Duffle Coat pattern, but since that will be a big project and I don’t have the materials for it yet, I’m not sure when I’ll start that. I like Jen’s patterns because they are simple, classic, very wearable and fit so well into what I want my capsule wardrobe to be (i.e. what I actually wear). As I continue to work on my handmade wardrobe, I can see myself sewing a lot of her patterns in the future.